Vavasour were the first to plant in what is now regarded as one of the premium grape growing regions of Marlborough, New Zealand. The soils here are free draining and the climate dry, warm and frost free. The area has a climate different to the rest of Marlborough so can produce wines with a unique and distinct flavour. Each year outstanding parcels of grapes are earmarked for special attention. When the resulting wine is regarded as outstanding, it forms the small quantity of wine under the Vavasour banner. While the fruit is the driving force in Vavasour wines, there is more focus on the structure, subtleties and complexity. The Vavasour range is designed to improve with age. The Vavasour family have a strong historical background. They can trace their ancestry back to the time of the Norman invasion of England. One of their ancestors is thought to have been a 'taster' for William the Conqueror. The rooster on the label is from the family crest, the emblem on the rooster is an indication of the family's lineage.The Vavasours arrived in New Zealand and established themselves in the Awatere Valley in 1890. After some research it was found that the climate and soils of the Awatere region were quite similar to those of the Wairau. In fact, the soil in the Awatere Valley is less fertile (this is a good thing) than the Wairau. Low fertility naturally restricts vigour in the vine. The Awatere Valley is also drier, and with no underground water the vines are bound to struggle. Although the conditions in the Wairau are similar, there are enough differences between the two valleys for to make unique and individual wines. In 1985, after the site was carefully assessed, the Vavasour family and friends decided to make a serious investment in viticulture - Vavasour Wines was established. The first vineyards (30 acres) planted in the region were on the Vavasour 'home' block. This vineyard was made up of two terraces. The top terrace was planted in Sauvignon Blanc and Chardonnay, while the lower terrace was planted in red varietals - Malbec, Merlot, Pinot Noir, Syrah and Cabernet. The first vintage was 1989. Within three years Vavasour had won numerous gold medals in both New Zealand and the United Kingdom. Glenn Thomas, winemaker, won Winemaker of the Year in 1992. Those first years officially put the Awatere Valley on the map of great wine making regions. 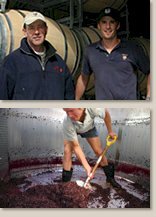 Vavasour are dedicated to the Awatere region and the philosophy is to concentrate on fruit grown in the area. Selected grapes are handpicked; this ensures that only the best fruit makes it into the bottle. The Vavasour vineyards are trained on the vertical shoot positioning trellis. In all its viticultural techniques Vavasour have focussed on quality over quantity. The intrinsic value characters of the Awatere valley are perfect for the production of Sauvignon Blanc, Chardonnay, Pinot Noir and Riesling. The emphasis remains on Sauvignon Blanc, however other varieties such as Pinot Noir, Chardonnay, Pinot Gris and Riesling will receive the golden 'Vavasour' touch..